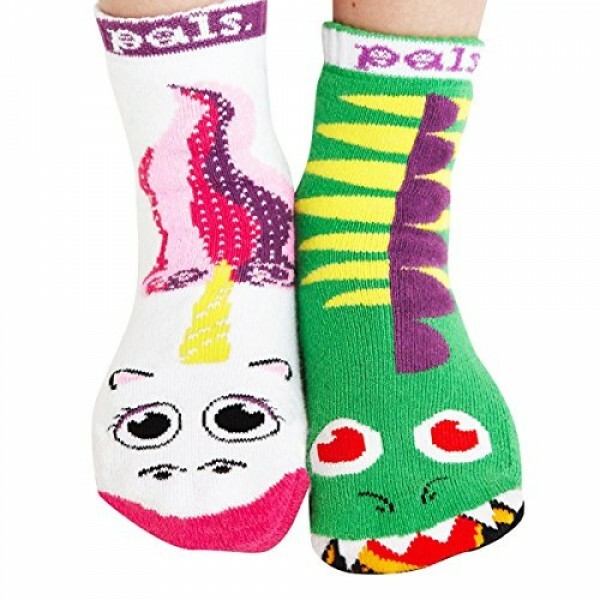 The concept of Pals Socks is to be mismatched on purpose, because it's fun to be friends with someone different than you. These fun socks pair a dragon and a unicorn that may not match but go together perfectly. Non-skid grips on the bottom ensure she'll be safe through all her adventures! Pals Socks also gives a percentage of profits to charities that help further this belief. Two sizes are available, one to fit kids aged 1 to 3 and one to fit kids aged 4 to 8. For more fun and empowering sock options, visit our Sock Collection.